Santa Claus may need to trade his suit for some shorts -- Christmas Eve in the D.C. area will be the warmest we've seen in decades. Christmas Eve will be cloudy, dry and extremely warm. Temperatures are expected to soar into the mid-70s. Thursday will shatter the previous record highs set at all three D.C. area airports. The warmest Christmas Eve on record at Dulles International Airport was set over 33 years ago when the temperature reached 71 degrees. A record high of 69 degrees was set at Reagan National Airport back in 1933. Baltimore Washington International Thurgood Marshall Airport set a record high of 65 degrees in 1990. New record highs will be set from Florida to Maine. 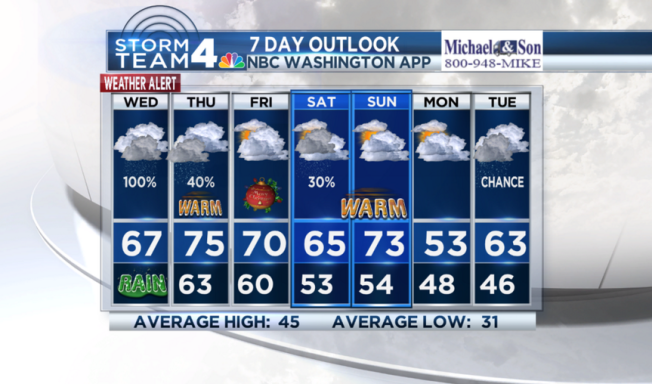 Iin the D.C. area, temperatures will be 30 degrees above average. Christmas Day will start in the 60s, and eventually climb to near 70 degrees. We may see some rain by early evening. As of Monday afternoon, the Christmas Day high is forecast for a high of 66 degrees -- that would put us in the top five warmest-ever.